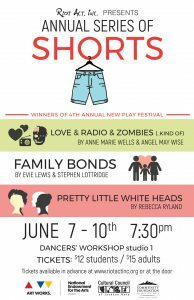 Riot Act, Inc. presents our Annual Series of Short Plays June 7-10 at 7:30pm nightly in Dancers’ Workshop Studio 1 in the Center for the Arts. 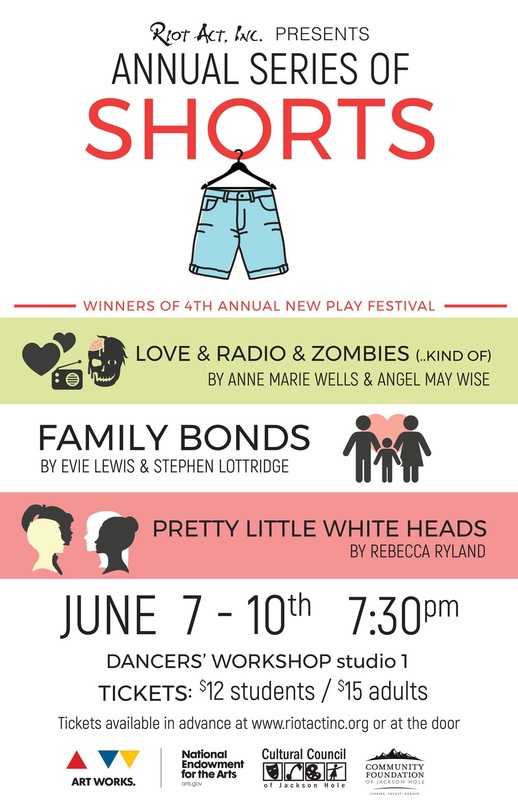 Riot Act, Inc. is thrilled to present the winners of its 4th Annual New Play Festival. Seven original works were submitted for the contest and judges ultimately selected three short plays to be produced as part of Riot Act’s Annual Series of Shorts. The first-place winner will receive $100 and the newly created Marius P. Hanford IV Award. Marius was a longtime stage combat choreographer influential in several theater communities, including Jackson and New York. The second and third finalists will be awarded $50 each. The day of the zombie apocalypse radio drama series finale, radio actors decide if they will leave their complacent worlds and take a risk on love. Featuring Anne Marie Wells, Chris Eichelberger, Diana Edlinger, and Jason Suder. The play is a dark comedy about three siblings’ last visit to their family’s forest service cabin after the death of their father bringing out the worst in their family dynamics. Featuring Patrick Nolan, Kari Hall, and Stephanie Capps. Brand new, re-designed Riot Act, Inc. T-shirts and Concessions will be available before each performance and during intermission.